Thank you! Thank you! Thank you! Allie graduated from speech therapy on December 17th and we couldn’t be more proud of her. She is doing well in school too. She had such a hard time last year because of her speech deficits, but this year is a new story. All those problems have been resolved and she is doing so well with reading. We couldn’t have done it without your help. It means so much to us and it is so much appreciated. Thank you from the bottom of our hearts. ​In November of 2011, our daughter was diagnosed with autism. We do everything we can to make sure she is the best Delaney she can be. She gets services through our school district and we also bring her to private speech two times a week, private OT twice a week, and have therapists come to our house twice a week. We have her enrolled in private swimming lessons and this spring she will be starting therapeutic horseback riding lessons. As you can imagine the bills for these services, along with her other medical expenses, are quite high. The good news is that Delaney continues to make progress in all of her activities and we are excited to send her off to kindergarten in the fall. She also has two siblings, and although they don’t need special services their activities are also expensive. We just wanted to let you know that we truly appreciate the help you are giving us by covering her speech bills. Every bit makes a difference! The world needs more people like you! We wanted to write and say thank you for your generous support. We’ve been paying for speech out of pocket for a few years and it has been a large expense on our family. Your gift will help our family and we greatly appreciate that. ​You are truly angels! I can barely put into words my heartfelt thank you to you for providing our Allie and Brody with financial help for Speech. Speech has been such a struggle for us to afford the last few years and service though the school district is not an option for us. Needless to say, we had a very bad experience with it and would like better for our children than that. This past December we were all set to quit speech therapy because we just couldn’t afford it. We felt so torn though because we know that our kids NEED it. Thank you so much for taking that stress away from us and investing in our children’s future. You are providing us and them with a truly amazing gift. I can’t thank you enough. It really means the world to us. I would like to thank you for developing and supporting the RiteCare of Minneapolis-St. Paul program. My daughter, Breanna, was a client during the program’s first few years, and the changes in her were very dramatic. RiteCare not only positively affected her ability to communicate, but her improved communication skills also improved all other aspects of her life. She went from a frustrated, tantrum-throwing child to a loving, chatty, outgoing little girl. It’s very obvious to her entire family that her inability to communicate caused most of her behavioral and emotional problems. If you have ever wondered if your work makes a difference, it does. Our family is living proof of the power of giving. Thank you for reaching deep into your hearts and making RiteCare not only a possibility but a reality. 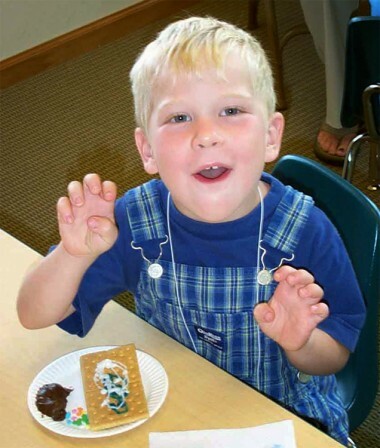 RiteCare® of Minneapolis-St. Paul has been a blessing to my little boy’s progress in speech. Parker will soon be five years old, and despite his outgoing personality, he has always been difficult to understand when he speaks. He has received special education services through our school district for two and a half years, but the effect of receiving assistance from RiteCare® of Minneapolis-St. Paul has been synergistic. We could hear almost immediate improvements in Parker’s ability to communicate. The piece of feedback that we get most often is from friends or family who do not regularly communicate with Parker. Just recently, my uncle from Nebraska who only speaks to Parker occasionally on the telephone said that for the first time ever, he understood all of the messages that Parker was trying to communicate. I credit the RiteCare® of Minneapolis-St. Paul for the progress that he has made in such a short period of time.